A quick view of the most influential metrics in Highland. High Ridges... Lakes... and The Scenic Delaware River! Highland is the year around home to a growing population of bald eagles. Its principal hamlets include Eldred, Yulan, Barryville, Minisink Ford and Highland Lake. Highland was formed from Lumberland on December 17, 1853, the same date the town of Tusten was formed, making them the 13th and 14th Sullivan County towns. 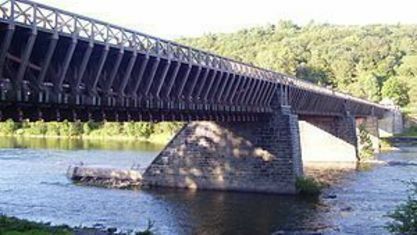 It is in the southwest portion of the county and its southern border is the Delaware River. The Revolutionary War Battle of Minisink, at which a group of Indians and Tories under the command of Colonel Joseph Brant routed a samll contingent of Colonial militia, took place within the town's borders on July 22, 1779. 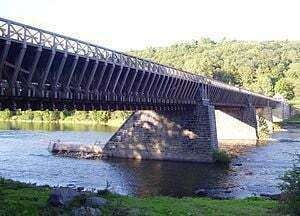 The Delaware & Hudson Canal, opened in 1828, entered New York State in the town of Highland, and the canal's Delaware Aqueduct, designed and built by John A. Roebling in 1848, has been completely restored by the National Park Service as a historic landmark. It is used today as a motor vechicle bridge, and is known as the Roebling Bridge, the oldest wire rope suspension bridge in the world. View our selection of available properties in the Highland area. Check out the latest demographic information available for Highland. Get to know Highland better with our featured images and videos. Learn more about schools near Highland complete with ratings and contact information. Browse through the top rated businesses in the most popular categories Highland has to offer.